What you do as a vocation or avocation? I am a writer––one who often writes about spirituality and yoga––but who always tries to share the power (and challenges!) of Transformation in my work. This is an impossible question for a writer, but the books I seem to open most often are Leonardo Da Vinci: The Complete Paintings (Abrams) because it's on my coffee table and I find it unbelievably beautiful and inspiring and Yoga by Linda Sparrowe another photo based book which I open all the time to gain inspiration when I teach. Again –– another impossible question, especially since I started piano lessons in 1st grade and have sung all my life. My mother's asked me to compose some Christmas songs, so since those are what I'm currently working on, I find myself humming those melodies the most lately. Why you are interested in spirituality? I want to understand the Mystery. I love quotes and post one or two favorites every day on my facebook fanpage. Well, I spend a lot of time on my own site www.EdwardVilga.com. 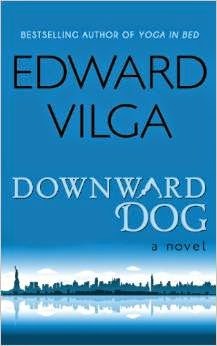 Finally, since Downward Dog has been optioned by Hollywood for the movies, I'm also constantly on the Pro version of IMDb –– https://pro-labs.imdb.com/ –– looking up actors who might just bring my characters to life. Your hero? Another "dog"––specifically, my chocolate lab, Belle. She's the happiest and most self-actualized being I've ever met, and like all truly great teachers, she instructs entirely by example. For me, definitely in a yoga class where I felt completely connected in my body, mind, and spirit ... but honestly, most often it's simply whenever I connect with my beautiful chocolate lab, Belle, who models for me unconditional love 24/7.